Author(s): Clement Lin, Danzhou Yang. College of Pharmacy, University of Arizona, 1703 E. Mabel St, Tucson, AZ 85721, USA. XR5944 is a potent anticancer drug with a novel DNA binding mode: DNA bisintercalationg with major groove binding. XR5944 can bind the estrogen response element (ERE) sequence to block ER-ERE binding and inhibit ERα activities, which may be useful for overcoming drug resistance to currently available antiestrogen treatments. 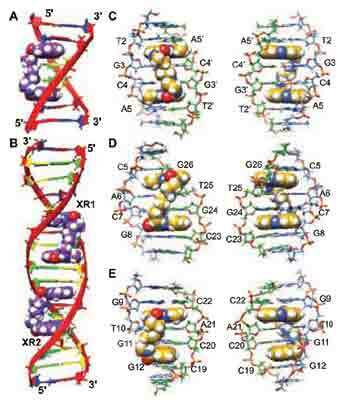 This review discusses the progress relating to the structure and function studies of specific DNA recognition of XR5944. The sites of intercalation within a native promoter sequence appear to be different from the ideal binding site and are context- and sequence- dependent. The structural information may provide insights for rational design of improved EREspecific XR5944 derivatives, as well as of DNA bis-intercalators in general. Keywords: Anticancer drug, DNA bis-intercalation, DNA bis-intercalation with major groove binding, NMR solution structure, XR5944 or MLN944. Affiliation:College of Pharmacy, University of Arizona, 1703 E. Mabel St, Tucson, AZ 85721, USA. Keywords:Anticancer drug, DNA bis-intercalation, DNA bis-intercalation with major groove binding, NMR solution structure, XR5944 or MLN944. Abstract:XR5944 is a potent anticancer drug with a novel DNA binding mode: DNA bisintercalationg with major groove binding. XR5944 can bind the estrogen response element (ERE) sequence to block ER-ERE binding and inhibit ERα activities, which may be useful for overcoming drug resistance to currently available antiestrogen treatments. This review discusses the progress relating to the structure and function studies of specific DNA recognition of XR5944. The sites of intercalation within a native promoter sequence appear to be different from the ideal binding site and are context- and sequence- dependent. The structural information may provide insights for rational design of improved EREspecific XR5944 derivatives, as well as of DNA bis-intercalators in general.